When it comes to wear and tear on your chimney, you might guess severe weather would be a culprit. And in a way, you’d be right. The biggest threat to the health and well-being of your chimney…is water. Yes, water. Damaged mortar joints between the chimney bricks are a serious problem (actually, “serious” is an understatement – this should be repaired as quickly as humanly possible). You may need to go up onto the roof to spot the problem, but the trip will be well worth it. When mortar joints fail, greater amounts of moisture are sure to follow. This will speed up every other form of chimney damage. See, water gets into small cracks. As the water seeps in (and freezes and thaws), small cracks become big cracks. Fix it fast or eventually the chimney will collapse. By now, we’ve established the fact moisture in your chimney or fireplace is always going to be a problem. You can be certain – for some reason – the chimney isn’t working properly. If the firebox or damper is rusty, it’s a sign of too much moisture. If the damper doesn’t close properly, this might also be a sign of moisture damage. Sometimes it gets rusty, and water in the chimney can cause the flue tiles to crack. Cracked tiles are extremely dangerous. If too much heat gets through, there could be a house fire. Imagine! Water causing a house fire! We wish we were joking. “Spalling” is a term which is likely unfamiliar to most people. It refers to when water actually enters bricks and concrete, forcing them to pop out, peel, or flake. It’s easy to discover spalling since pieces or masonry start falling from the chimney. If your Milwaukee chimney is older, watch carefully for this. This is another development which can cause the chimney to be destroyed. A different problem is when slices of flue tiles start piling up at the bottom of the chimney. The term to describe this is shaling, which indicates the flue tiling is damaged. It is absolutely essential for the flue liner to be intact. It’s the only way for the fireplace to be safely operated. If you see shaling, contact the Milwaukee chimney experts from Wisconsin Chimney. A special camera can be used to spot the problem. Otherwise, the necessary fix required can be very difficult to see. This is another problem – probably requiring an actual inspection by a Waukesha chimney inspector from Wisconsin Chimney. The crown needs to be in good condition since it’s the first defense against water. During winter, water will seep into the chimney. The water will then freeze and thaw, expanding and contracting. Cracks begin the destructive process. If the water gets in between the masonry and the liner, shaling and spalling could occur. If this occurs near the chimney, it’s a strong indication of too much moisture in the chimney. Many homeowners mistakenly call for a home inspection or roof inspection when it’s really a chimney inspection which is needed. If your house is in Brookfield, a Brookfield chimney inspector from Wisconsin Chimney will do a complete analysis, checking to see if chimney brick repair is needed. Falling mortar joints usually indicate chimney tuck-pointing is needed. New Berlin chimney specialists from Wisconsin Chimney can repair the mortar joints. 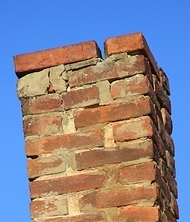 The process will be needed only in the section of the chimney which is above the roof. The chimney portions below the roof are better protected against the elements and usually last longer. Also, if the chimney cap is missing or damaged, water damage will start at the top of the chimney and work its way down. If any areas where the mortar are soft or missing, they should be tuck-pointed. Your Wauwatosa chimney expert from Wisconsin Chimney will expertly provide this service. 8. Do you see white stains? If the outside of your chimney is stained with white, it’s yet another indication of water damage. The natural salts in the bricks are brought to the surface by moisture and then left on the surface when the moisture evaporates. The stain is easy to wash off but it won’t solve the problem. If you see white staining, look for a missing chimney cap, damaged crown, or missing or aging mortar joints. Your Milwaukee chimney repair technicians from Wisconsin Chimney can help you identify the problem and repair it. If chimney repairs are done quickly and properly, you’ll be assured of a safe, long-lasting, and enjoyable chimney life. For expert repairs, inspection and analysis along with recommendations for preventive care, contact the chimney repair specialists at Wisconsin Chimney.